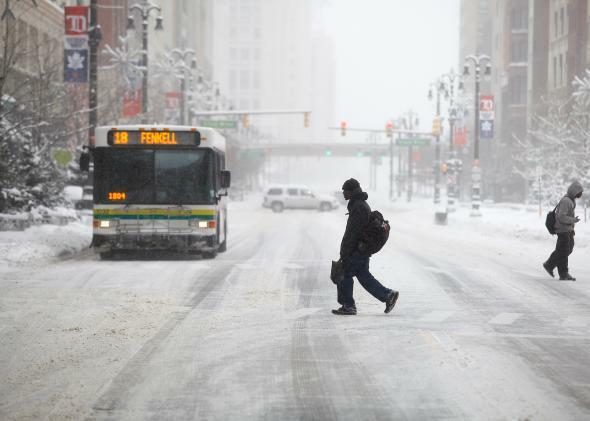 Detroit’s James Robertson commutes 21 miles to work each day. On Sunday, Bill Laitner of the Detroit Free Press profiled Detroit resident James Robertson and the extraordinary lengths he goes to in order to go to work each day. The 56-year-old factory worker commutes 23 miles each way to work everyday—often walking 21 of those miles. The story is one of incredible, almost unimaginable, endurance; it is also a rebuke of cuts in the city’s public spending that have left public services, such as transportation, almost nonexistent for low income workers. Robertson began walking to work after his 1988 Honda Accord quit on him a decade ago. He leaves the house each morning at 8 a.m., takes the bus and then walks eight miles of the journey to make his 2-10 p.m. shift. It takes him four hours to get to work, and each night his walk home is even farther (13 miles) because of the bus schedule. Every trip is an ordeal of mental and physical toughness for this soft-spoken man with a perfect attendance record at work. And every day is a tribute to how much he cares about his job, his boss and his coworkers. Robertson’s daunting walks and bus rides, in all kinds of weather, also reflect the challenges some metro Detroiters face in getting to work in a region of limited bus service, and where car ownership is priced beyond the reach of many… The sheer time and effort of getting to work has ruled Robertson’s life for more than a decade, ever since his car broke down. He didn’t replace it because, he says, “I haven’t had a chance to save for it.” His job pays $10.55 an hour, well above Michigan’s minimum wage of $8.15 an hour but not enough for him to buy, maintain and insure a car in Detroit. Once the front page story was published, the response was immediate. Thousands of dollars poured in through crowd funding. On Monday, the Free Press reported more than $80,000 was raised to help Robertson get to work more easily. Robertson said Sunday he was flattered by the attention he’d gotten for his arduous commutes after the Free Press published a front-page story about him – and amazed that complete strangers would respond so generously, some by offering to buy him a new car and others offering to give him one. “Are you serious?” he said to a reporter after hearing of one crowd-funding effort alone that, by early Sunday night, had raised $30,000 — $25,000 more than the goal of the originator, a Wayne State University student… A Downriver car dealership offered to give him a 2014 Chevrolet Cruz or Sonic. “He gets to choose,” said Angela Osborne, customer service specialist at Rodgers Chevrolet in Woodhaven… More than a hundred others offered cash for a car, or their own cars, as well as bus tickets, bicycles and even daily chauffeur service for Robertson.